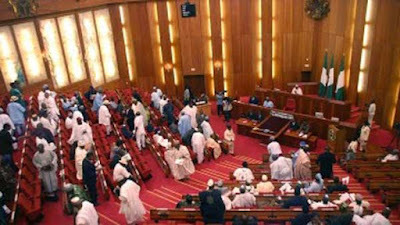 The senate at today's plenary session resolved that all ministerial nominees must have the endorsement of 2 senators from their state before they could be granted a pass during their screening. Chairman of the Senate ad hoc committee on Media and Publicity, Dino Melaye who announced the new conditions today, said the upper legislative arm will also adopt other constitutional provisions and conventions for screening nominees. He said the Senate would also apply Section 147 of the Nigerian constitution which states that a ministerial nominee must be an indigene of one of the 36 states of the federation, before that person can be screened. Melaye however did not state what will be the outcome if a ministerial nominee fails to get the support of 2 senators from their state of origin. It appears former River state governor, Rotimi Amaechi may be having a tough time at the senate with this new condition as all 3 PDP senators from his state have expressed their opposition against his nomination. In a related development, some of the minsiterial nominees have reported to the Nigeria Police Headquarters for profiling as directed by President Buhari. Those that have reported so far includes former Lagos state governor Babatunde Fashola, Audu Ogbe, Chris Ngige, Udoma Udo Udoma and Abubakar Malami.